Forestry Services - Sumac Geomatics Inc.
Up to date forest estate information is critical to operational planning, regulatory compliance and long term sustainability. Advanced forest inventories provide measures of timber/ fibre quality along with digital terrain models for forest engineering. This combination allows resource managers to better plan and deploy resources to maximize value, increase profitability and support long term sustainability. All field sampling, photo interpretation, image and LiDAR classification is completed within a tightly controlled framework of standards, quality control procedures and audits. Forest Management Planning occurs at the Strategic, Tactical and Operational levels. At the strategic level, the long-term management term, direction and objectives are established. At the tactical level, harvest blocks are identified and road building requirements determined of the term of the plan. At the operational level, identified harvest blocks or groups of harvest blocks using Total Chance Planning are characterized and mapped in detail: season of harvest, distribution of tree species and products (sawlogs or chips) terrain features and sensitive areas, and the location of roads, water crossings, landings and chip pads. Focussing on tactical and operational considerations; using high resolution multispectral imagery in a softcopy (3D) environment, Sumac assists forest products companies to develop maps that assist their operational planning. Through delivering customized mapping in commonly used ArcGIS® – ready formats, forestry companies can prioritize, and best assess deployment considerations for their crews on the ground. Research trials such as those focused on shallow soils, shoreline harvesting, commercial thinning, boreal mixed wood, prescribed burn. With an eye towards innovation, Sumac has been developing and testing the use of UAV acquired multispectral imagery and automated object based image classification to provide a spatially explicit block map showing crop trees, competing species, lesser vegetation and, productive and non-productive openings. Servicing the pulp and paper mills of Northern Ontario, Sumac Geomatics provides targeted volumetric reporting processes that help stock managers fine-tune their purchasing and production policies. 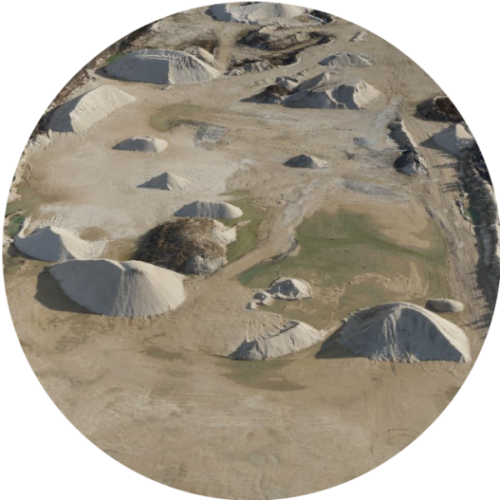 UAV-based volumetric measurement techniques provide a faster, safer and higher resolution method of measuring stockpile volumes. Precise measurement of output volumes enables production deficiencies to be identified, and for purchasing of input materials to be ordered so as to minimize cost on the mill’s operating budget. For Sumac’s customers, the monthly near-real-time reporting services that Sumac provides now enable reconciliations to take place on a monthly rather than quarterly basis too.